I’m going to make a pretty bold statement: I’ve found a routine that simplifies laundry and actually makes this dreaded task enjoyable. Okay, maybe enjoyable isn’t the word. Although, I’d be lying to say that I don’t find enjoyment in the sight of empty laundry baskets. I think the word should be, doable. My goal for Live Simply is to help you (and me, because I’m right here with you on this journey) simplify real food and natural living. While most of the time we talk about crock-pot burrito bowls, granola bars, and homemade hand soap, I believe it would be a disservice to dismiss the daily tasks that can make preparing real food or mixing together a bottle of hand soap a huge challenge. The tasks that can consume so much valuable time. If you’re neck-deep in laundry, it’s hard to think about spending extra time making healthy food. 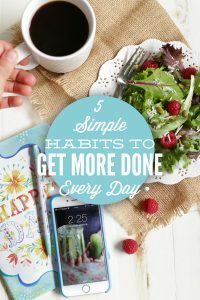 I haven’t figured out all the secrets to simplifying every task in my house, but slowly I’m learning to create routines that make time-consuming, complicated tasks more doable and less time-consuming. My home isn’t perfect, so please don’t misinterpret the simplifying beyond the kitchen posts as a demand for perfection. Trust me, my friend, we have our messes–we live within the four walls of our home. 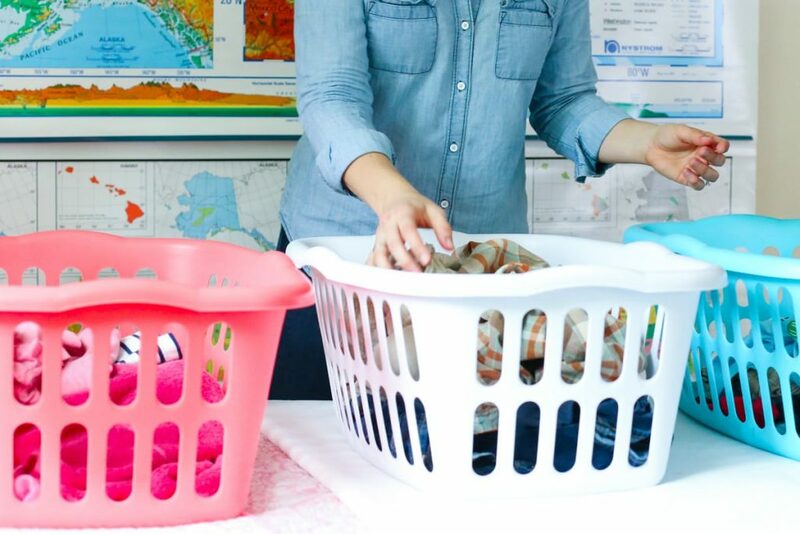 Last month we devoted quite a bit of our DIY time together talking about laundry. 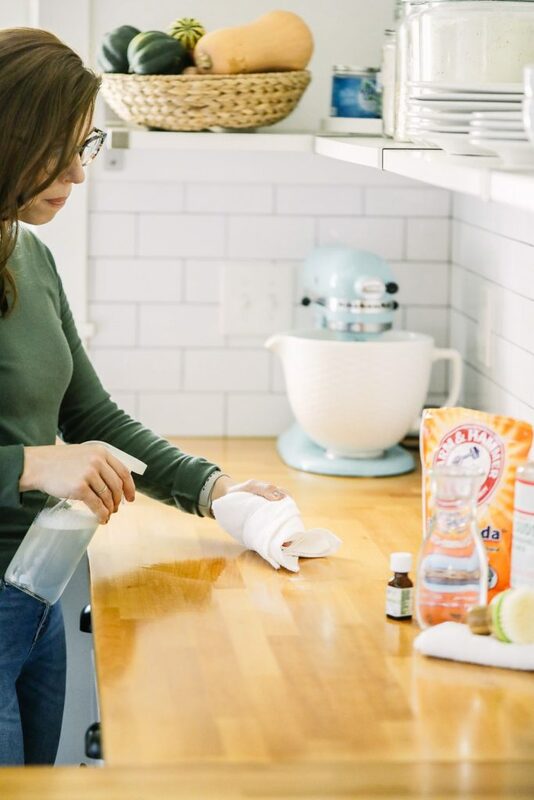 We talked about how to make an effective stain remover, a three-ingredient homemade bleach alternative, and the simplicity of making a homemade Oxi-Clean powder. One laundry basket accumulated all the clothes and towels throughout the week. I would throw dirty dish towels in the washing machine where they would sit for days. Everything else would gradually build like a child’s tower of blocks until the laundry basket just couldn’t handle one more piece of clothing. Once the laundry basket was piled as high as a mountain, I would set out on a laundry expedition. I usually spent all weekend washing and drying clothes and towels. I felt defeated, frustrated, and overwhelmed by such a complicated task. My laundry epiphany came three months ago. I decided enough was enough. One of my biggest laundry issues was the fact that we owned sooooooo many bath towels. Our linen closet door couldn’t be shut due to the amount of towels hanging off the shelves. Since we owned so many towels, we took the liberty of using as many towels as possible. This meant an overwhelming amount of the laundry basket was being consumed by towels! Simplification was needed. I gave away nearly all but four white towels, two for the downstairs half bath and two for guests. I asked each family member to choose a color and then purchased the corresponding towels. Now everyone owns two towels in one particular color: Dustin-yellow, Kristin-blue, Piper-green, Londyn-pink. This act alone has greatly reduced the amount of dirty laundry. I shared our towel system in this post. Before simplifying laundry I had one laundry basket. ONE! 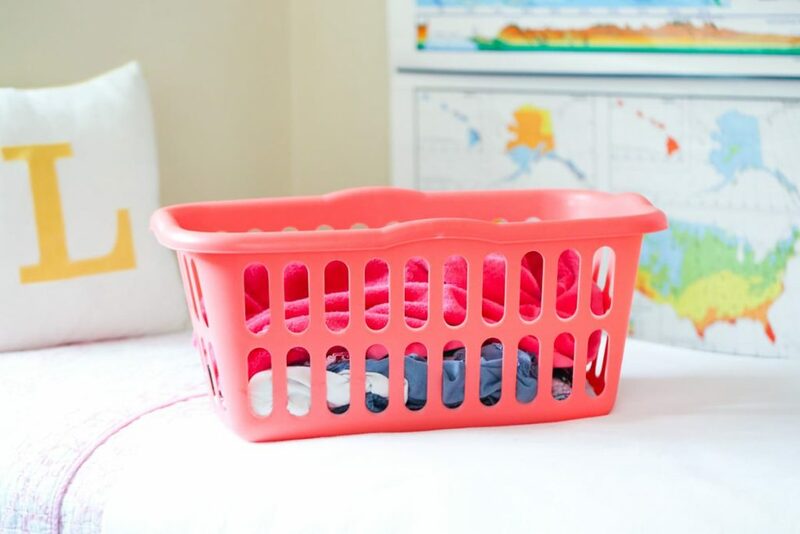 To help simplify, I purchased a different color laundry basket ($4.99 at Target) for each room where laundry would accumulate: the kids’ room, our room, and the shared kitchen/dinning room. The kids share a room, so they were given two laundry baskets, a pink basket for Londyn and a blue basket for Piper. Tending to laundry once a week was too overwhelming. 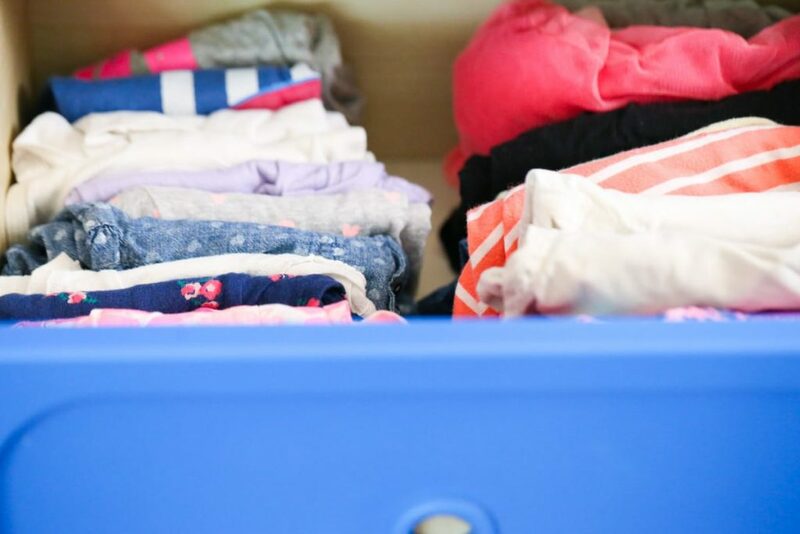 Not only would I spend all weekend washing and drying, I would become so frustrated by the lengthy process I would never get around to actually folding the clothes or putting them away. 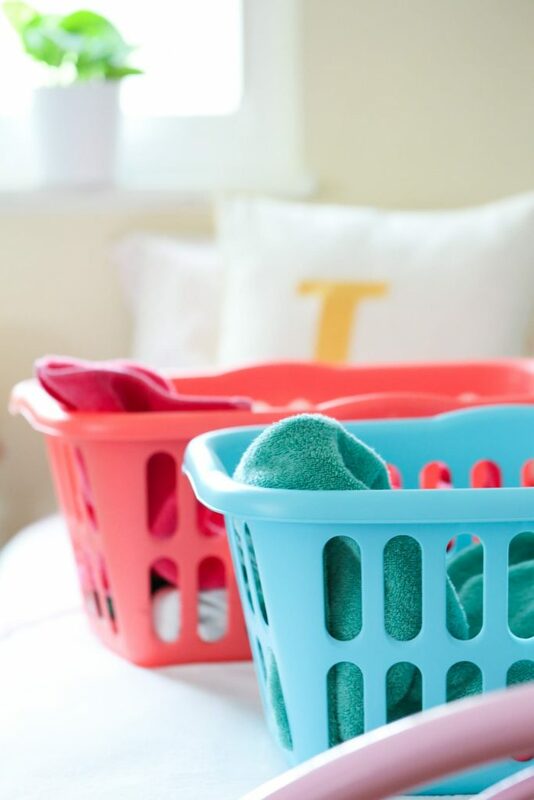 We would live out of the dryer or laundry basket for days or even weeks following a laundry session. Instead of a weekly schedule, I created an every day schedule. I didn’t think we dirtied enough clothes to run the washing machine this often, but I was proven wrong. Plus, most washing machines offer low and medium water level options. I wash our laundry every day. The bulk of the laundry is clothing, socks, and dish towels. Bedding and bath towels are washed on the weekend. In the morning, upon waking and getting my coffee, I walk around to each room to gather laundry (from the previous day). I dump all the clothes and towels into one of the four baskets (usually the basket from our room), and then stack the remaining baskets under the “main” laundry basket. 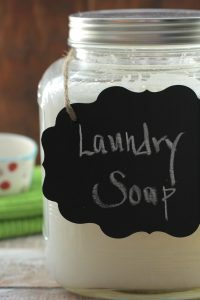 Once the clothes and baskets are gathered, I turn on the washing machine and add my laundry soap. Then, I add the clothes and walk away. I don’t sort according to color. Once the washing cycle is complete (usually after my shower or breakfast), I pull the clothes out and place them in the dryer with dryer balls. At this point the laundry is done and I can go on with my day. In the evening, after dinner, I head back to the laundry room and unstack all the laundry baskets on the floor. I open the dryer door and pull out each piece of clothing, sorting it into the correct basket. I DO NOT fold the clothes, just sort according to their final destination. Dustin’s clothes go in our white laundry basket, along with my clothes. Piper’s clothes and towel go in the blue basket. Londyn’s clothes and towel go in the pink basket. Now it’s time to pick up the baskets (I usually just stack them on top of each other with the clothes and towels inside each basket) and go to the rooms. I place each basket in the correct room and put the clothes away. This takes less than 10 minutes total–the time I’m suggesting in this post :). I realize every household is different. 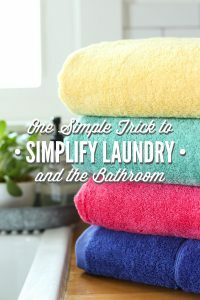 My goal for today’s post is to encourage you to think about how you can simplify the task of doing laundry. 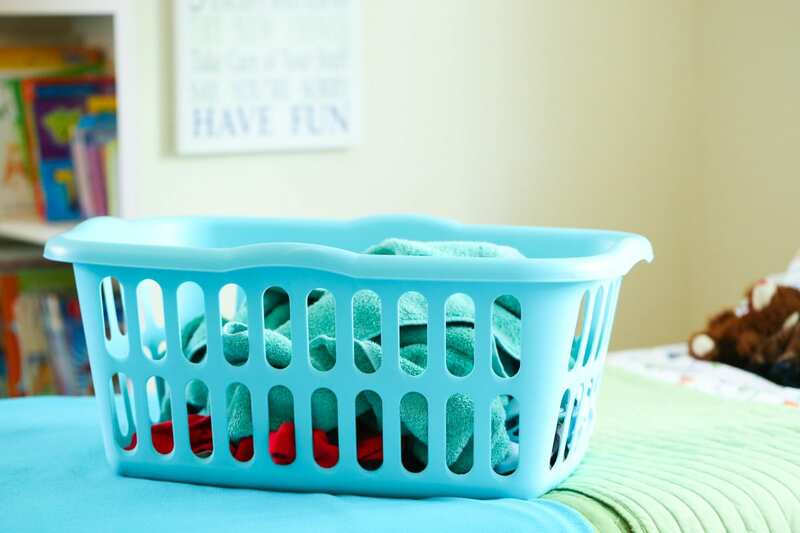 What kind of schedule/ routine can you create to make laundry a more doable task so you can spend more time enjoying your family versus feeling like you’re buried under a mountain of clothes and towels every week. Let’s end the complication of laundry!! Very organized routine! I keep the idea of having less towels, we have A LOT too and when sometimes they’re all clean I don’t have enough room in the closet for all of them. This has to stop! Here I have the washing machine and dryer in the bathroom, so I have a basket I bought at Ikea with 2 different baskets, one for white one for color. Everyone is asked to put dirty laundry at the right place, nothing should lay around the rooms. We are 4, like your family, including a 20-month baby. I wash once a day, sometimes less. I only dry towels, cotton underwear.. the rest dries naturally. As we have soft water now, the laundry does not need to be ironed most of the times yay! When I fold laundry I put what belongs to each room on the beds and each member of the family puts his/her laundry in the closet. and let’s say it, since we’re having less clothes, the laundry is so much easier!!! Hey Prettyarty, What a great routine! Thank you for sharing. Yes, the towels were a huge problem in our house…HUGE! Decreasing the number of towels we owned and switching over to an organized color towel system, although it sounds a bit crazy, made such a big difference. I especially love the idea of keeping the “spare” linens for a bed under the bed itself! This would free up some much-needed room in our linen closet. Yes, the bath towels are only washed once a week, unless a towel is needed for a dirty task (example: the kids play outside in the rain and get muddy). Sorry if that wasn’t clear in the post. Thanks for pointing this out! I updated the sentence that I think could lead one to believe I wash towels daily…oops! I love your laundry posts!!! I have tried many things and I’m still not completely happy with my routine-it needs some fine tuning. 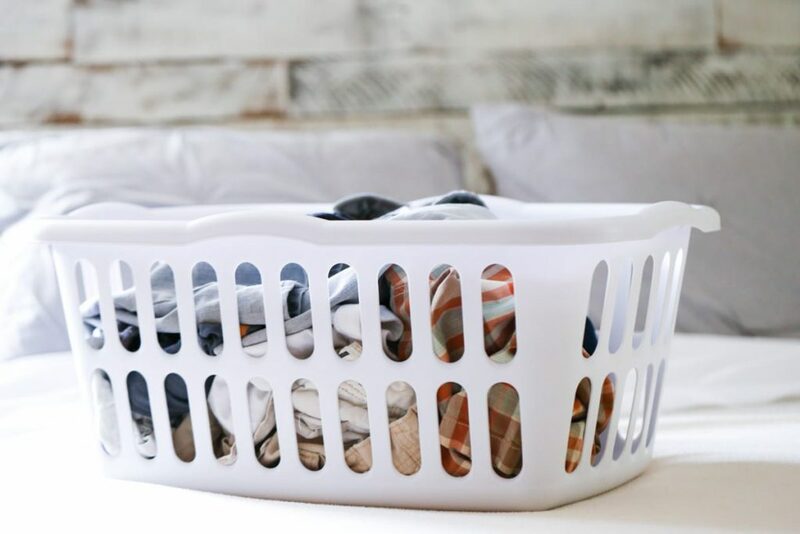 It’s the folding of laundry that’s not working-ends up in piles on the floor-I really like the idea of taking all the baskets down to the laundry room and then sorting it right out of the dryer. Can’t wait to give it a try. Thank you! Thank you, Brandi. It’s great to hear the posts are helpful. I tried so many routines and methods, too. Let me know how it goes…I hope it’s a success for you :). 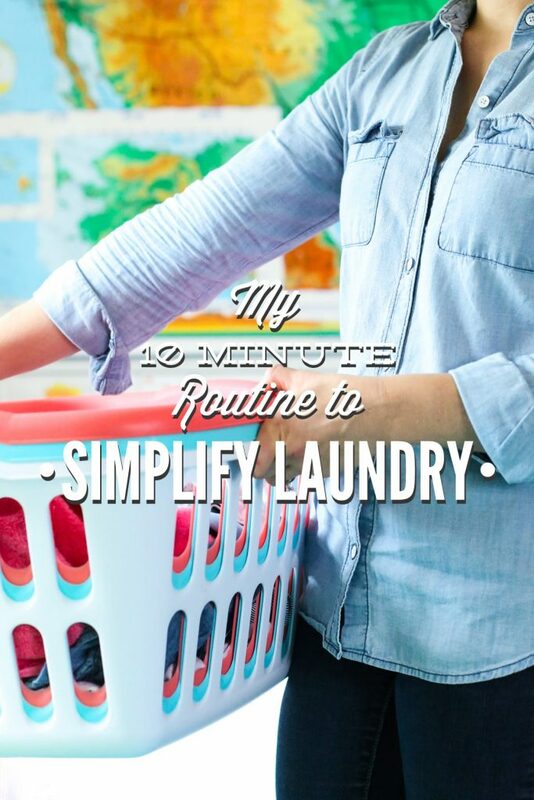 This is a great post, and I’m so glad you found a laundry routine that works for your family! I used to spend all weekend doing laundry too, and still find myself handling some laundry on weekends but not nearly as many loads as I used to. For our family of three, I’m doing laundry about every other or every third day. My husband works as a machinist so has some thick, bulky clothing like carhartt jeans and flannels that take up a lot of room in the laundry, so we’re constantly running a load of darks, it seems. I was wondering if you have plans for a post in the future that outlines your household cleaning schedule? 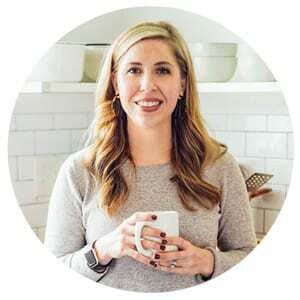 Due to your homemade products, and cute house and how you care for your family, I’m interested to hear what chores you tackle daily, weekly, monthly, and seasonally, and how often you are replenishing your products. 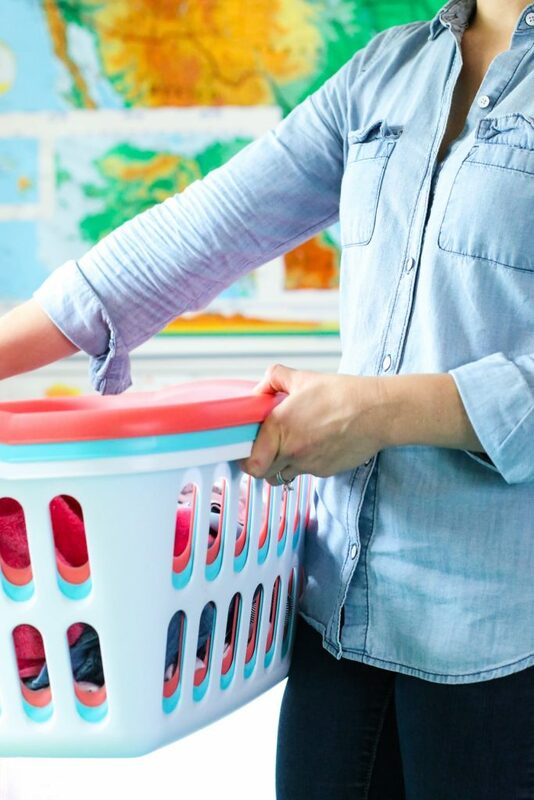 As a busy working mom, I find myself most Sunday evenings not nearly satisfied with the amount of housekeeping left undone, and with the new workweek already beginning.. So I’m guessing that you have some amazing tips for us readers! Hey Allison, I’m so glad you enjoyed the post. Thank you for the post suggestion. I’ve been thinking about writing a cleaning schedule post for some time now. I’m putting the idea on my calendar so it actually happens :). Right now, I clean our house (cleaning toilets, mopping the flour, dusting, etc.) every two weeks, and I do everything in one day. Then, it’s just a matter of up-keep: sweeping every few days, daily dishes, and daily laundry. I usually make our cleaning products, as needed, since most of them are simply combining ingredients in a bottle. Your routine is almost like mine except I own only one laundry basket and I do the laundry everyday. This way I have very little to fold and put away. I somehow manage to run at least a half load each day as my toddler and infant babies dirty a lot of clothes each day. When I have not much to wash I start looking around for sheets to throw in. I used to do sheets twice a month but now I think it’s more often. But I think it’s ok for me as my babies tend to dirty them anyways. I used to loathe doing the laundry because of the overwhelming pile. But now as soon as its out of the dryer I fold it n put it away right away, takes 10 minutes at the most. This gives me a lot of time to do other things. I also vacuum everyday with my strong Bosch cordless vacuum cleaner. This means I can do a quick vacuum under the beds even with very little dust to actually vacuum since it’s done everyday. I live in a 3 room apartment so this too takes me 10 mins sometimes less. Such a great routine, Seets! Thank you for sharing. Each person has their own basket. Each person has their own day to be washed. The house has it’s own day. Put the clothes straight onto hangers if using a dryer or hang on the line on a hanger. I don’t even put clothes off the line into a basket. I’ll simply grab the socks together and walk them into that persons drawer etc. Good exercise. Hey Maggie, We’ve eliminated a lot of clothes over the past couple of years. We narrowed it down to only clothes we actually wear–it was amazing how many extra items we had, both kids and adults. This has really helped simplify laundry as well.